Businesses use technology to grow and become more efficient. Our team has worked with clients that range from small, local businesses to Fortune 100 corporations. While the complexity varies, our approach is the same. Keep hardware and software simple. Avoid complex configurations. Planning and maintenance always reduce costs over time. Always! Secure and back up your corporate data! Everything else can be replaced. An initial free consultation. 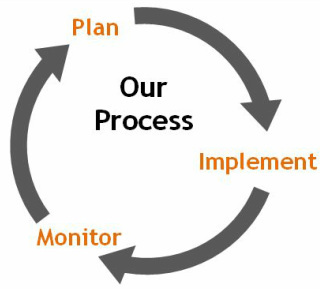 We will work collaboratively with you to produce a plan that keeps your requirements, budget and timeline in mind. A team that is responsive, professional and efficient. Client service is our top priority. Honest assessments, useful recommendations and reasonable rates.